Master Hayashi had about five thousands of students, among which about a dozen were Yamaguchi's relatives in Ishikwa prefecture, middle west of Japanese island. Chiyoko Yamaguchi learned Reiki directly from master Hayashi in March 1938. Chiyoko and their relatives kept using Reiki during and after the war. In mid 1990th, Chiyoko and her son Tadao noticed Western Reiki was introduced to Japan from abroad but it was not the Reiki they have been practicing. They felt it was very important to promote and spread authentic Reiki. In order to rebuild the seminar contents that master Hayashi taught, Chiyoko and Tadao visited all their relatives to collect notes, materials and memories related Hayashi's seminars and teachings. 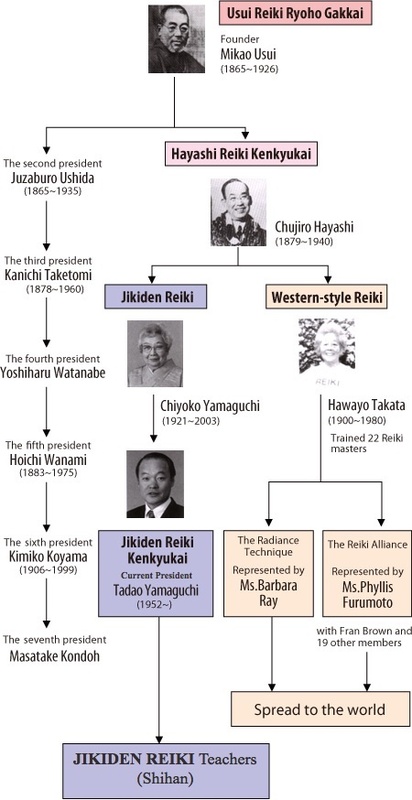 They successfully recovered Hayashi's teachings and established the Jikiden Reiki system in 1999. "Jikiden (直傳)" means "directly taught". Since then, over 10,000 people learned Jikiden Reiki in Japan and another 10,000 people learned it abroad in over 44 countries. There are thousands of Shihan-kaku and a few hundres of Shian. The more detail history of Jikiden Reiki is taught in a seminar with various historical　photographs and materials. Chiyoko passed away in 2003 at the age of 81. Her son Tadao is now the representative of Jikiden Reiki institute. Frank Adjaver Petter, who was a well-known Western Reiki master fell in love with Jikiden Reiki and is now the vise representative of the institute. You can visit the Jikiden Reiki Web site for more information.